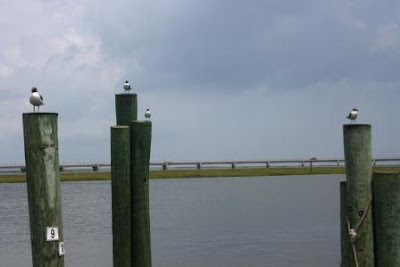 We were delighted to find that there were plenty of activities for kids on Chincoteague, even though it is not as developed as other beachy areas. 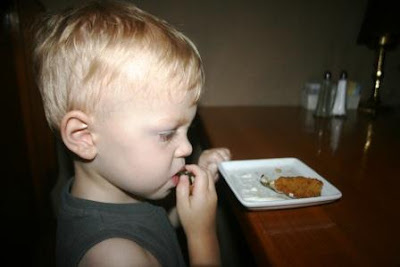 We tried fried pickles for the first time at Bill's. I had a crab cake sandwich. Maryland is known for it's crab cakes, and we were close enough to Maryland that this one was excellent! 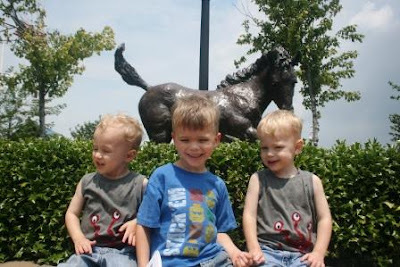 The boys took a picture in front of the Misty statue. And we watched the gulls. 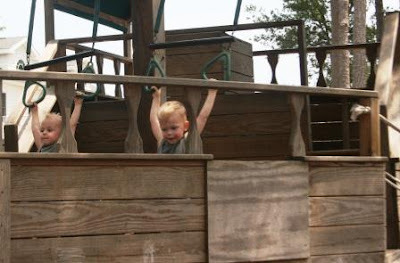 We found a most unusual playground called Memorial Park, where the pirate ship was a huge hit with the boys. Cort and Reid compete to see who can swing the highest. There were peekholes down in the galley. 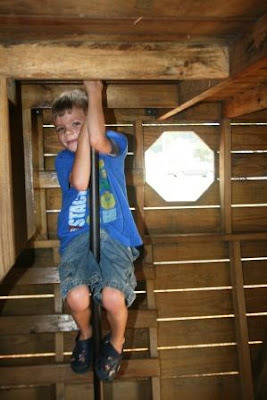 And even a pole to slide down. Pierce begged to get a pet hermit crab. So we have a new addition to our family. A new addition with an angry bird painted on its back! Quite a friendly critter, actually. I had one as a kid. Also from a beach trip. Pierce named her (him?) Misty. Did you have any unusual souvenirs you brought back from a beach trip as a kid? The weirdest souvenir I ever took home with me was a tobacco plant from Indiana back to Iowa. I even took it on the school bus and to show and tell that day at school... I was obviously a strange child. 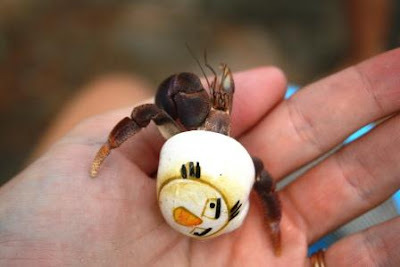 I think it would be hard to top a hermet crab with an Angry Bird on it. Looks like a great time! !! Looks like great food too. Oh what fun times your boys look so happy. The sandwich looks absolutely delicious! That playground would be every little boys dream! When I was little and the family would go on vacation, I would collect "Dream Pets" from each state we visited. They were small stuffed animals! Hope you have a great Monday, Lisa. I love crab cakes! Yum! We use maine crab meat though...since it is available locally. But, someday I would love to have a local maryland one! Looks like a fun time! A hermit crab! What a cool souvenir! That looks like it was a great vacation. There is an Amish place just across the TN border near us that makes & sells all sorts of wonderful wooden buildings, etc. They have those neat ships, too! Such a fun filled vacation! Love the photos--looks like the boys had a ball! We used to look for sharks' teeth on the beach and collect those. For what reason, I don't know. Wait a second. Is that alive? Eeks! You really did some fun things while you were there! Looks like they had a blast...too cute! 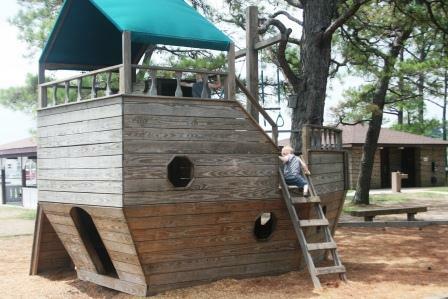 the pirate ship looks like a lot of fun! I'm glad you guys had such a great time! I love all the photos. The boys are so cute in front of the Misty statue, and the playground. So the fried pickles weren't a big hit with the boys? 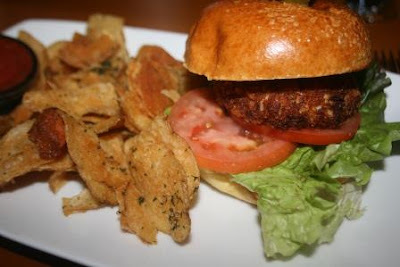 Your crab cake sandwich looks delish! That seagull photo reminds me of "Finding Nemo" where all the seagulls are yelling "Mine! Mine! Mine" (in reference to fish scraps they want to eat). I absolutely love crab cakes. We have great ones here in the NE. They look like they had so much fun!! Oh, my. All the other hermit crabs are poking fun at Misty. Too cute tho. Looks like a grand time! Oh my! Hermit crabs...I remember 'babysitting' yours! I love Maryland crab cakes! Truly one of the good things I get to experience when going back east to visit my inlaws! When I was a kid I wanted to bring a piece of seaweed home. Now I can't even imagine how awful the smell would have been after being in the car for a couple of hours! Fun pictures of your three cutie pies!! Love the hermit crab...brings back memories. We so wanted to try crab cakes in MD! The situation just didn't present itself. We were running that entire day and we ended up eating out of the cooler both times. Yours looks amazing! 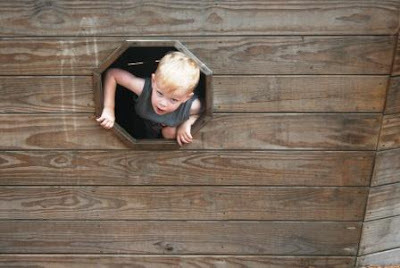 Those playground pictures are so cute! Lisa the boys are really getting big! your crab plate looks so good! Thanks for your sweet comment...I really needed them all! I think a small piece of me went with him...We were so close! Wishing you a wonderful week! Thanks again! Looks like you had a GREAT time and I am glad one of those gulls didn't poop on your head. Once again I vetoed the hermit crab when we were at the beach this summer. You are a good woman. We think its fun to watch the Gulls too! What a wonderful day! 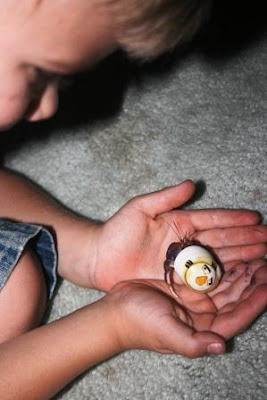 I used to have pet hermit crabs too!!! Love them! Yummy...I love fried pickles. What a neat ship for the boys to play on. Misty is very cute. My children never had those when they were little. Looks like a fun time and I love the playground. Really cute!